If you’ve followed Berks County Eats, then you know that Julie and I have been expecting the arrival of our first child. Well, last Friday, he decided it was time. 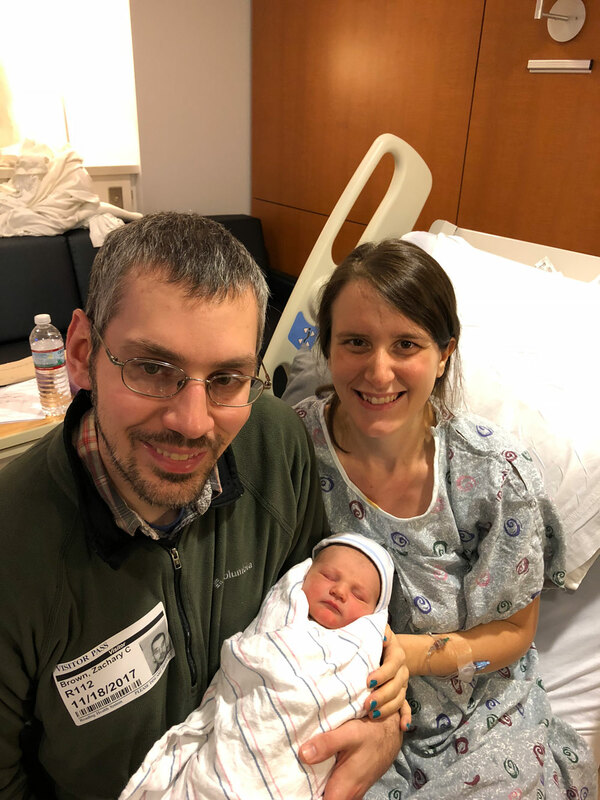 On November 17, 2017, at 8:21 p.m., Jakob Laurence Brown was born at the Reading Hospital. Mommy and baby came out of it happy and healthy, and we arrived home on Sunday evening, but not before Jakob joined us for his first Berks County Eats review. 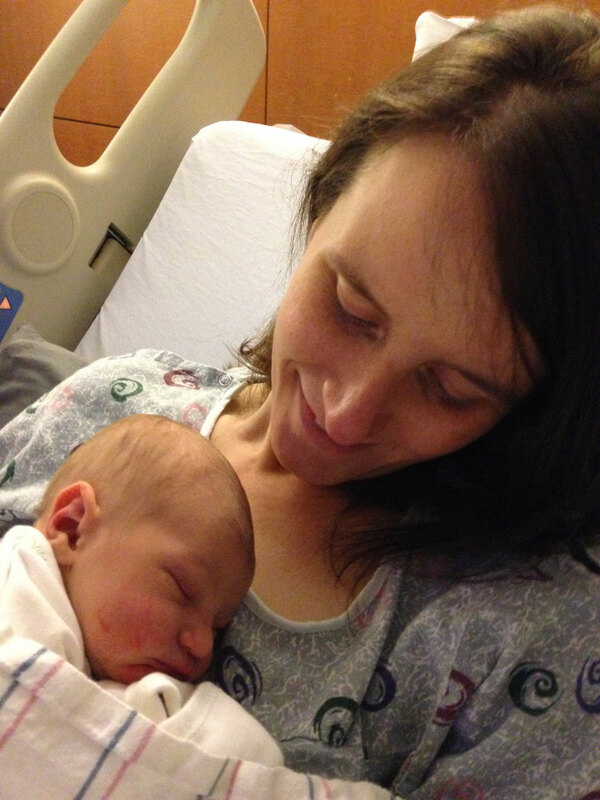 After completing a three-week birthing class two months ago, Julie’s reward was a coupon for a celebratory dinner for two after the arrival of our baby. On Sunday morning, just a few hours before we were scheduled to leave the hospital, a special menu was delivered to our room. “You’re Expecting the Best. 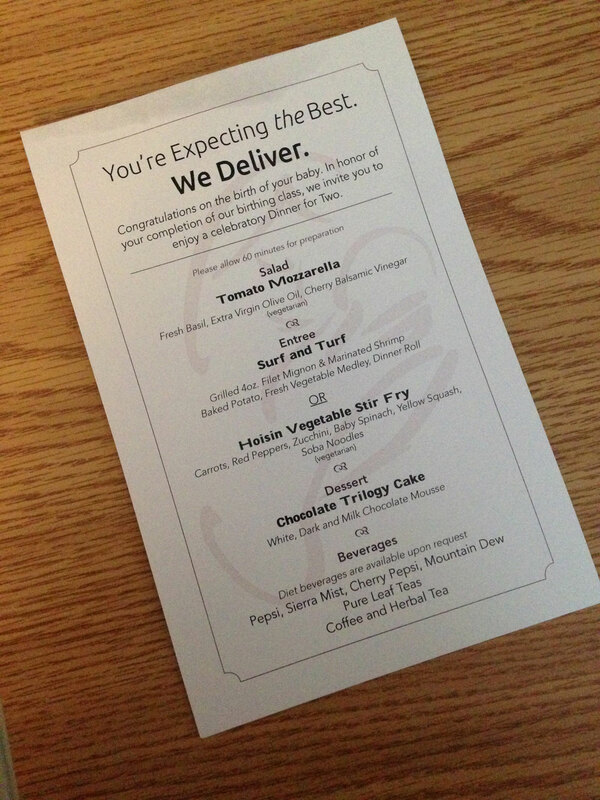 We Deliver.” When you’re delirious with joy at the birth of a child, you forgive menu puns, even bad ones. 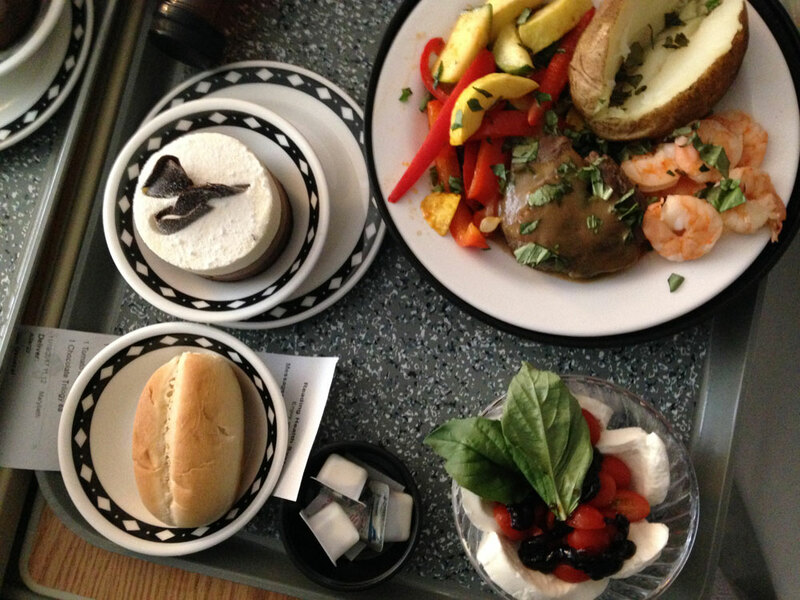 The meal included a tomato mozzarella salad (also known as Caprese), choice of entree – either steak and shrimp or vegetarian stir-fry – and a three-layer chocolate mousse cake for dessert. 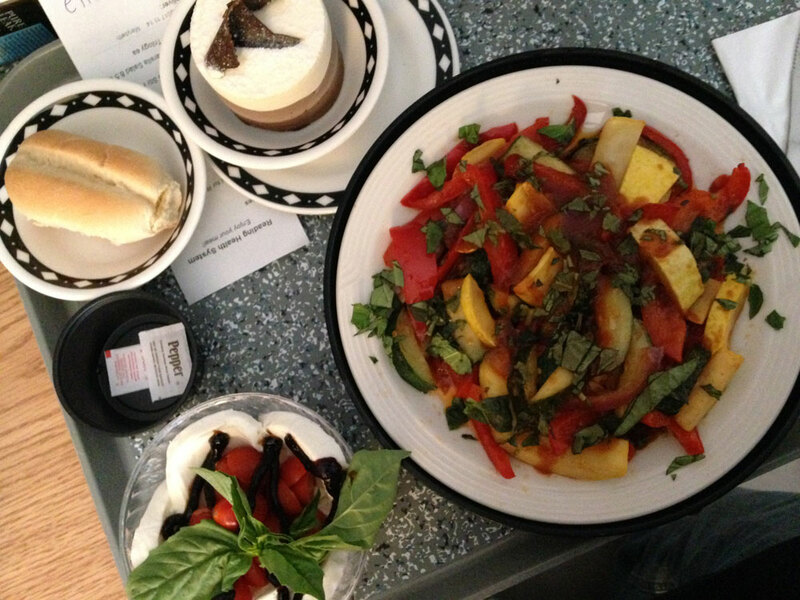 For the salad, our bowls were lined with thick-sliced mozzarella, which was then filled with cherry tomatoes, drizzled with a thick balsamic and topped with basil leaves for garnish. The salad was very good, but way too much. We each only ate a very small amount so that we had room for our main course and dessert (we managed to sneak the rest home with us for later). So while steak and shrimp was appealing, I thought the hoisin vegetable stir-fry was a more sensible option. It was actually really good, all things considered. It wasn’t anything special, but the sauce had a nice flavor – a typical sweet and salty Asian stir-fry. The menu listed soba noodles as part of the meal, but they were missing. So it was all vegetables – peppers, squash and onions. I certainly wasn’t going to send it back (it’s a one-hour wait from order to delivery). Julie, on the other hand, did all the work so no one was going to deny her the surf and turf dinner that she earned. It included a small filet and shrimp with a baked potato and mixed vegetables (the same medley that was used for my stir-fry. The steak was topped with gravy (meh) but was fair. It certainly was nothing like eating in a steakhouse. The steamed shrimp was ok, too, but nothing outstanding. The hardest part about the meal was having to stare at the chocolate trilogy cake. The best part of the meal was eating it. It was fantastic. The layers of white, milk and dark chocolate mouse melted together. There was the thinnest layer of cake on the bottom to add a little texture. And the pieces of dark chocolate on the top were the icing on the cake, so to speak. If only we didn’t have to be in the hospital to enjoy it. For anyone out there looking to deliver in the Reading Hospital and unsure about whether to take the birthing class: take it. If only for the chocolate trilogy cake. While we ate, Jakob lay in his crib – a clear, plastic tub that we had wheeled next to us. It was our first real sit-down meal as a family, and Jakob’s first official Berks County Eats review. It wasn’t the best meal we’ve ever had. But it is easily among the most memorable. Congratulations!!! Your family is beautiful!!! Thank for sharing with us. Blessings to you! Hubby and I love your reviews! Thanks! Fantastic news! Congratulations to all three of you!